I’m no expert on password security, but this seems to be… unnecessarily complex. I needed to hop onto the store’s WiFi to respond to a request, and on asking what the password was, this was plopped down in front of me. I’m all for creating and using stronger passwords. But I’m not so much for writing down those stronger passwords (that should really be what a password manager handles for you). I was thinking a lot about the classic xkcd comic on passwords, and how the optimal password for humans is something lengthy and memorable. The gibberish passwords (like the one listed above) are the hardest for humans to remember and use. 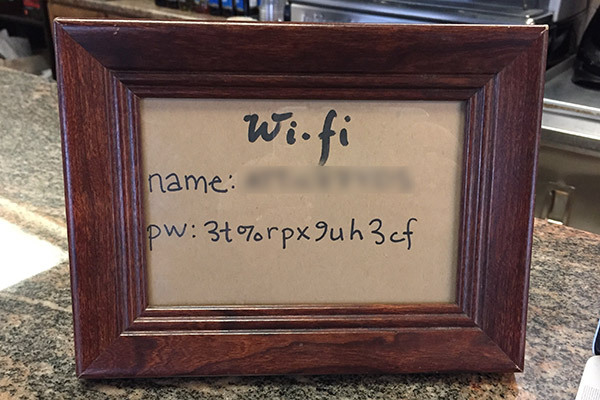 I’m guessing that someone with a tech background did help set up the WiFi network here. But it’s not the most customer friendly thing in the world, and almost feels a little aggressive. For a publicly available password, having something this complex seems like just overkill. While we’re on the topic of passwords, I’m hoping that you’re using some kind of password manager to handle all your various passwords. I use 1Password and really do love it. There’s definitely a learning curve, and there’s definitely a certain amount of setup and configuration. But the upside is that once you’re set up, you won’t really ever worry about passwords ever again, except for just one. I’m a big fan of password managers, 1Password in particular, and can’t imagine my life without it.